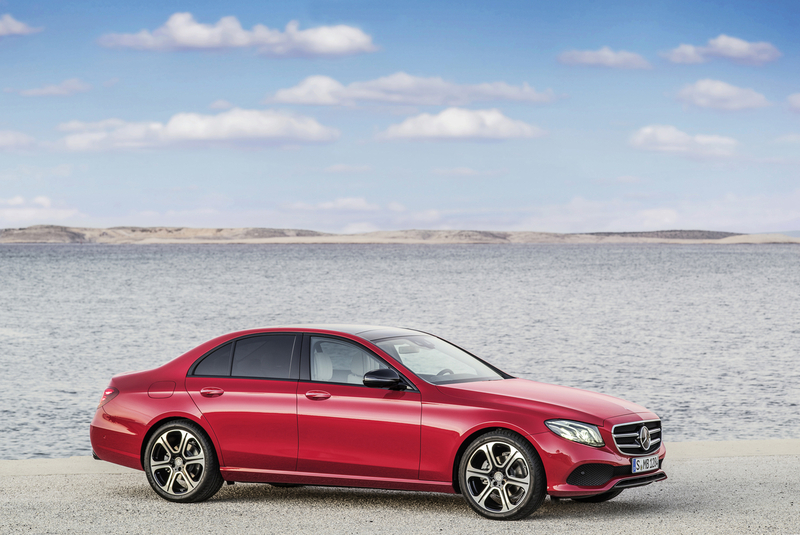 Mercedes-Benz is taking a big step into the future with the new E-Class. 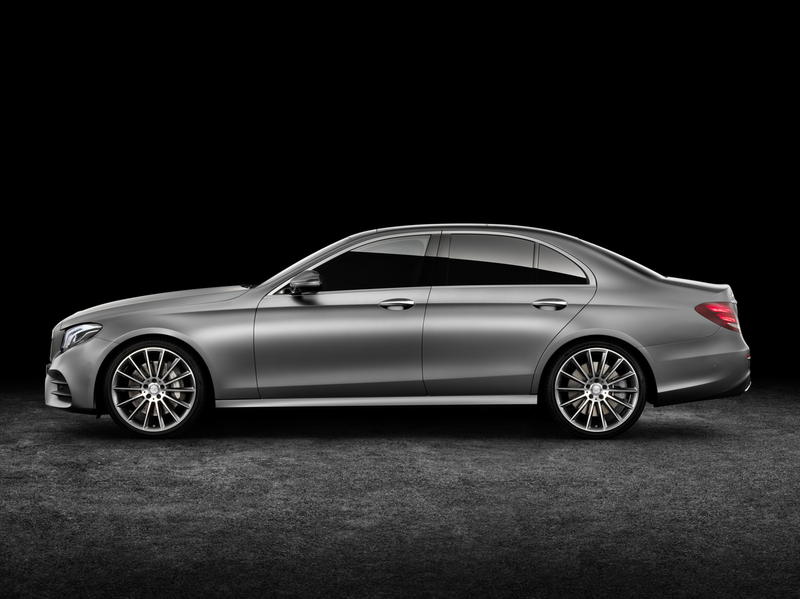 The tenth-generation of the E-Class sedan delivers stylish highlights with its distinct, emotional design and high-grade interior. 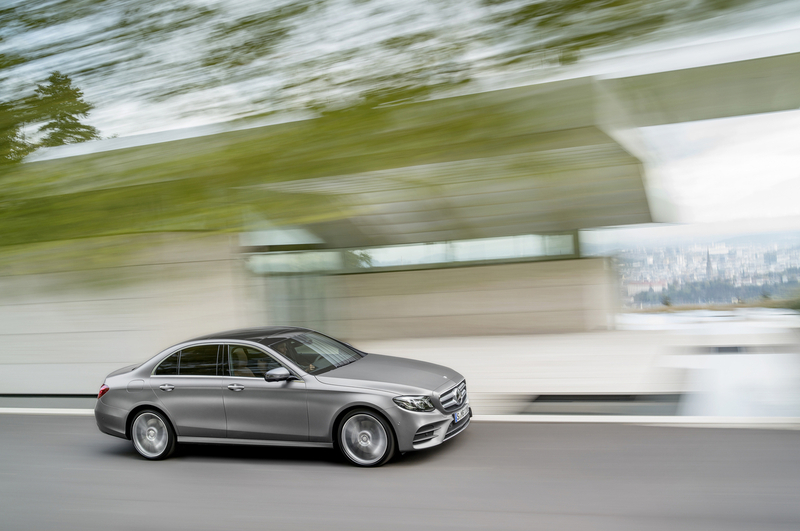 The new E-Class also marks the world premiere of numerous technical innovations, enabling enhanced comfort, a new level of safe driving, a new dimension in driver assistance and a new infotainment and control system. 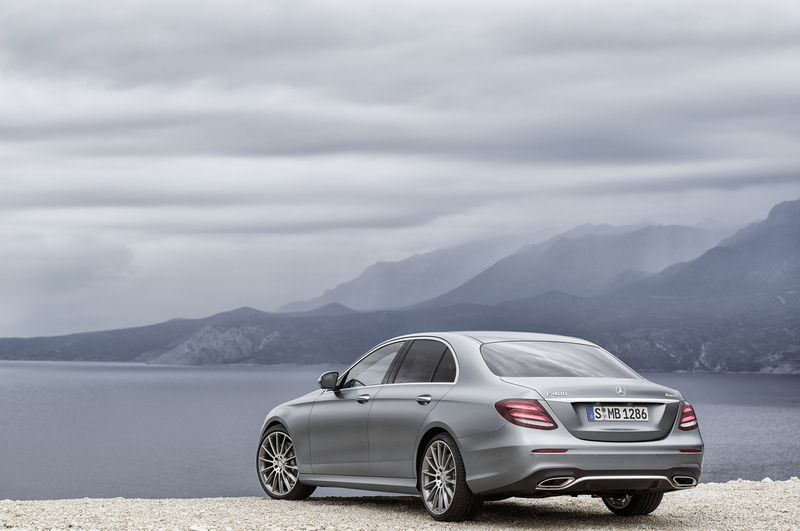 A new, optionally available AIR BODY CONTROL air suspension ensures outstanding ride comfort and driving dynamics. 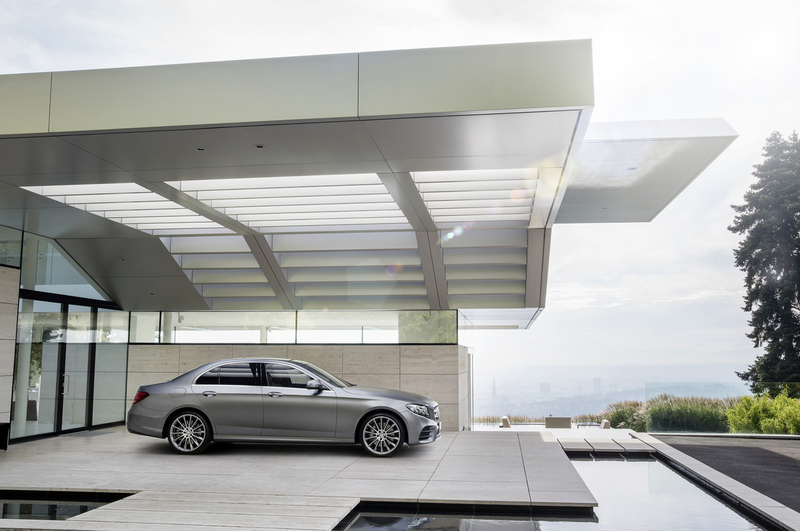 The sum total of these innovations makes the E-Class the most intelligent sedan. 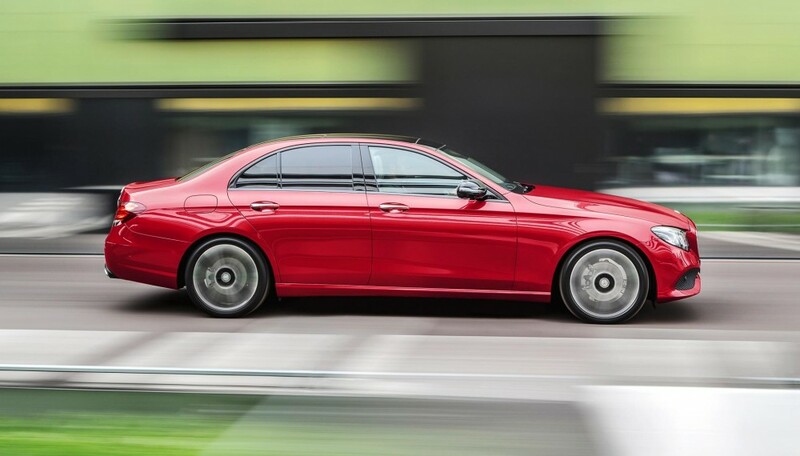 “The E-Class is the core of the Mercedes-Benz brand and in the past has repeatedly redefined the standards in the business-class segment. Now it carries this tradition into the future with a wealth of top-class innovations. 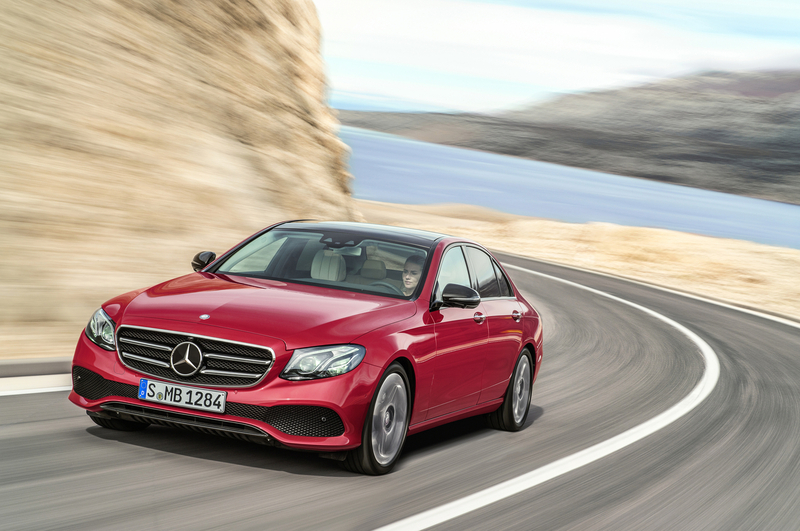 The new E-Class takes another major step towards fully autonomous driving. 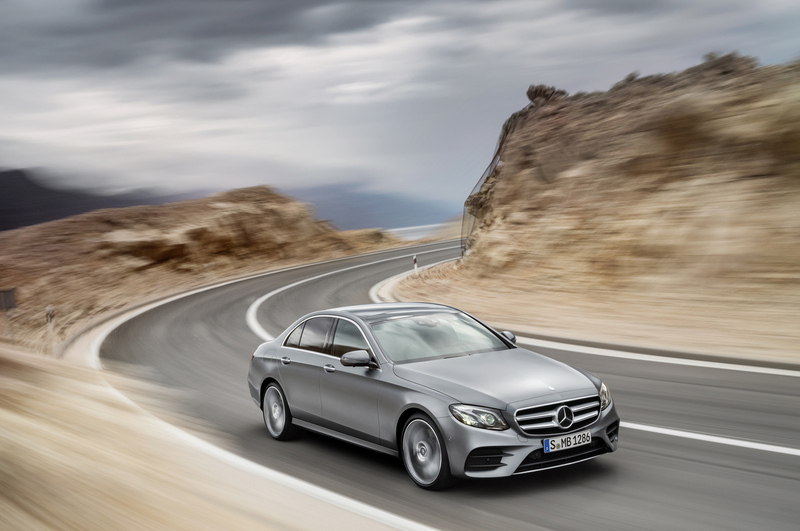 In addition, it enhances efficiency, safety and comfort, reduces the stress level when driving and intensifies driving pleasure,” says Prof. Dr. Thomas Weber, Member of the Board of Management of Daimler AG, responsible for Group Research and Mercedes-Benz Cars Development. 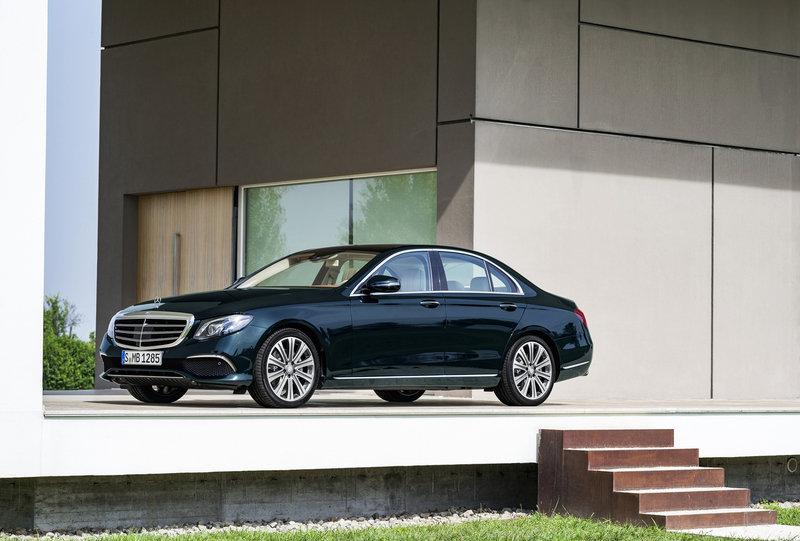 A muscular front end underlines the status to which the business-class sedan aspires, boasting a different look for each design and equipment line. 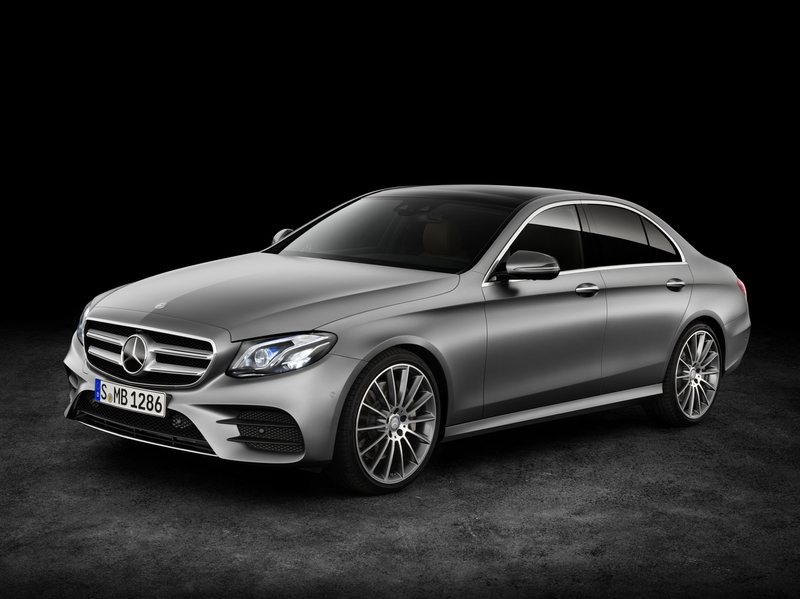 The Luxury version features the classic Mercedes radiator grill with the star on the hood, while the Sport models are identifiable by the sport radiator grill with a large Mercedes star as its centerpiece. 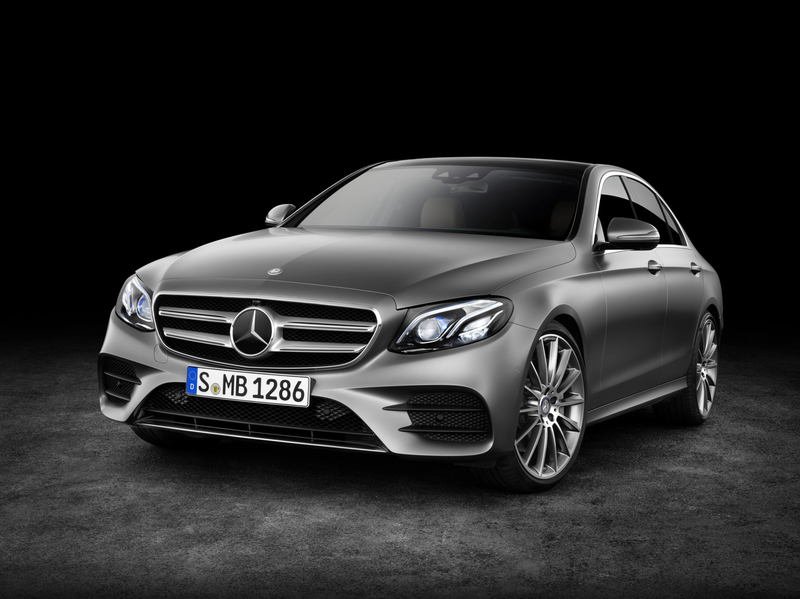 Each of the radiator grill designs lends the E-Class a distinct character, offering a unique degree of diversity that makes each model stand out. 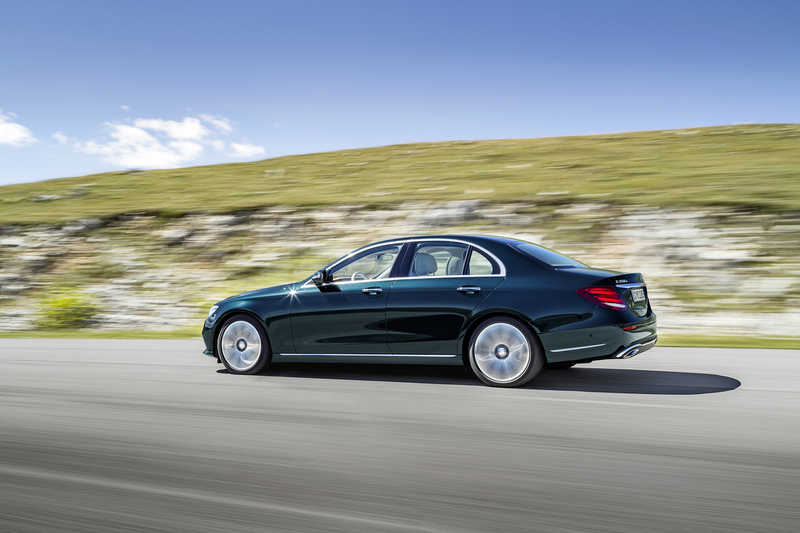 At the rear end, broad shoulders above the rear wheel arches lend the E-Class its unmistakably muscular character. 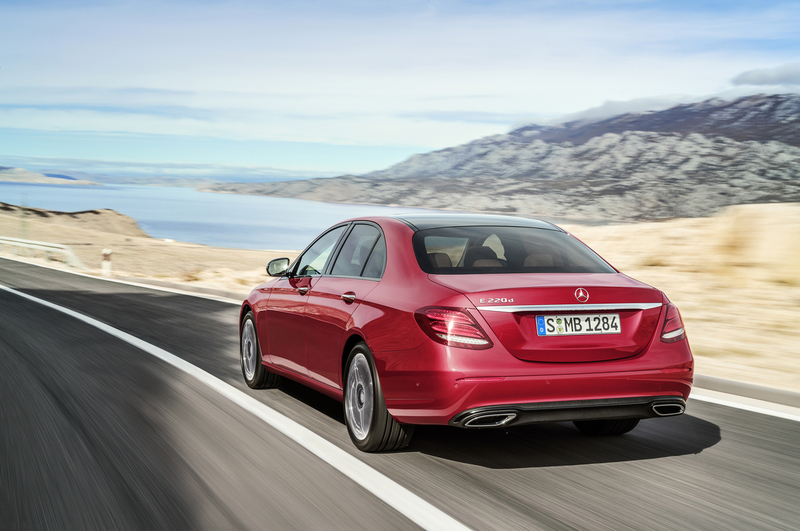 Single-piece tail lights featuring a two-bar design framed by the vehicle body clearly identify the E-Class as a new member of the Mercedes sedan family. 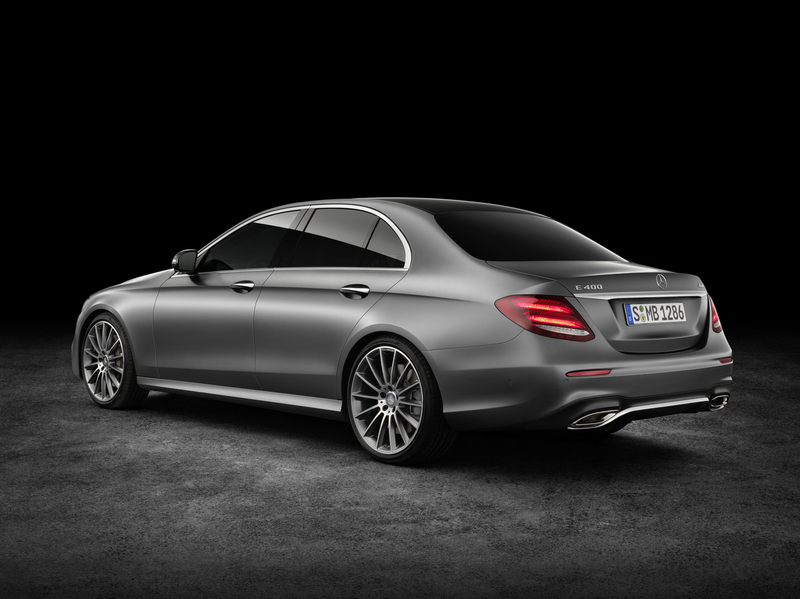 Rear lights provide additional levels of detail with an appearance designers refer to as the “stardust effect.” Making its debut on the new E-Class, this available “stardust effect” is created by innovative reflector technology with a specially configured surface structure for the tail lights. 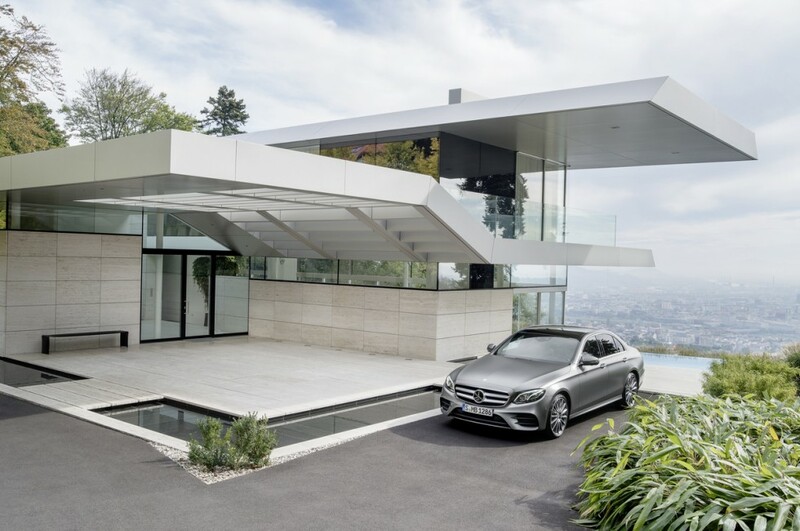 The interior of the new E-Class embodies the synthesis of emotion and intelligence, poles that are defined by the Mercedes-Benz design philosophy – distinct forms with a sensual flow to them. 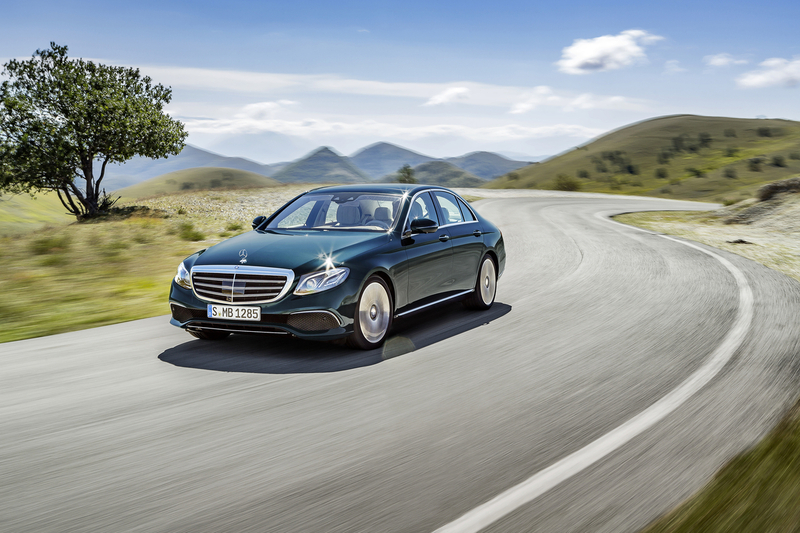 The U.S. version of the E300 offers a next-generation high-resolution display, with a wide navigation display screen diagonal of 12.3 inches – a first in this segment, and a traditional gauge cluster behind the steering wheel, all integrated into one casing. Beneath its integrated glass frame, the display visually conflates into a wide-screen cockpit that seems to be hovering in thin air, creating a central element that emphasizes the horizontal orientation of the interior design. Touch-sensitive control buttons (‘Touch Controls’) on the steering wheel make their first appearance in a car. Like a smartphone interface, the Touch Controls respond precisely to horizontal and vertical swiping movements, allowing the driver to control the entire infotainment system without having to take their hands off the steering wheel. In keeping with the motto “hands on the wheel, eyes on the road,” this new control interface minimizes driver distraction. Further controls for the infotainment system are provided by a touchpad with a controller which can recognize handwriting in the center console and a voice control system, accessible at the push of a button. For systems such as air-conditioning or various driver assistance systems, there are direct-access buttons located on the center stack. A new, intelligent graphic design with high-resolution animations, together with simplified logic, further enhances this all-new infotainment experience. 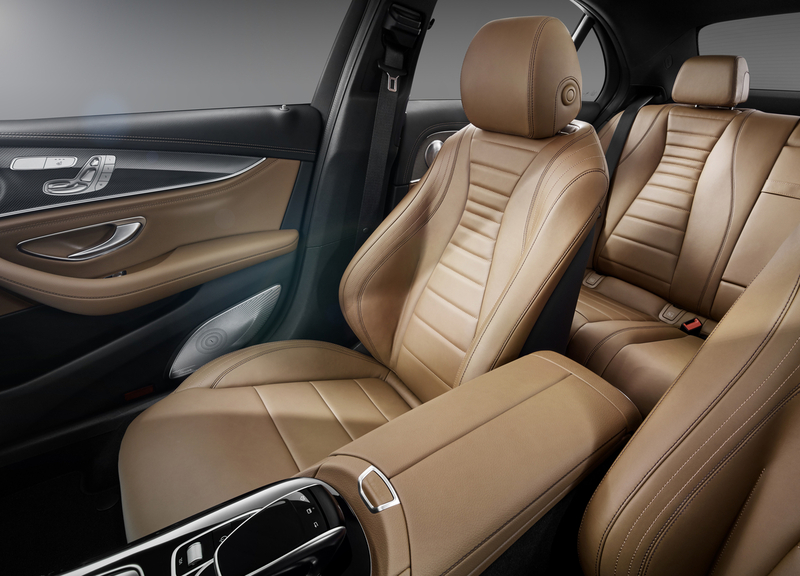 At the same time, the occupants enjoy a spacious interior, which combines the elegance of the luxury class with sportiness. 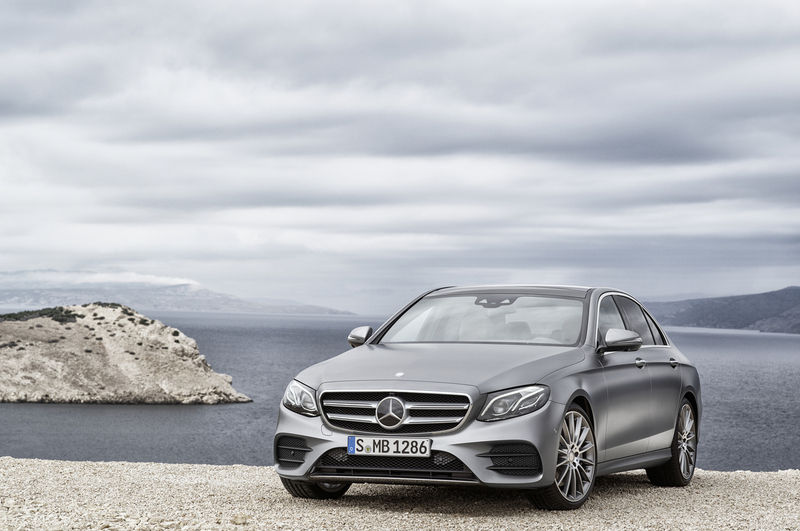 High-quality materials define the E-Class’ interior style, including Natural Grain Ash wood, and wood with “flowing lines.” Another Mercedes hallmark clearly evidenced is the high-quality look and feel created through meticulous attention to detail and craftsmanship. Interior materials and colors have been carefully selected, highlighted by various shades of brown, including several attractive, new color combinations which allow for an even more personalized interior design. Interior lighting makes exclusive use of durable, energy-saving LED technology, even throughout the enhanced ambient lighting system. With 64 colors to choose from, the ambient lighting system offers a host of possibilities for personalization, adding touches of light to various trim parts, central display, storage on the center console, handle recesses, door pockets, front and rear footwells, overhead console, and tweeters (if the vehicle is equipped with the Burmester® high-end 3D surround sound system). A further highlight of the new E-Class is its seats. 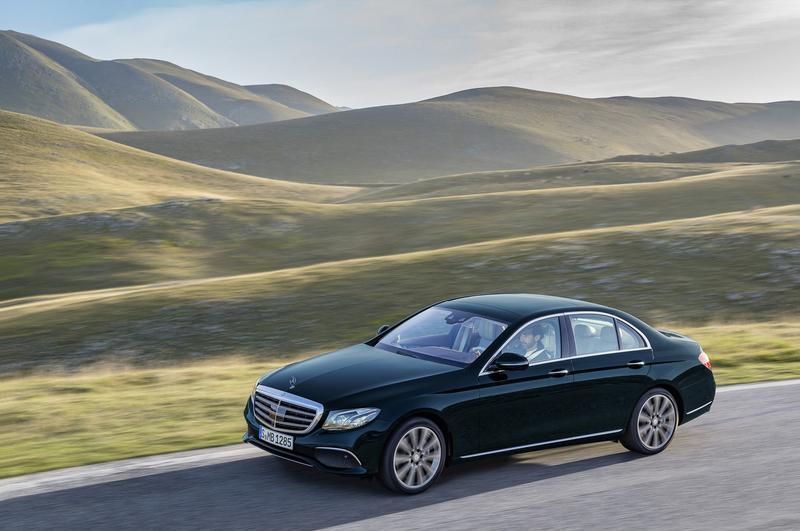 Their ergonomic and sculpted form combines Mercedes-Benz’s hallmark suitability for long journeys with a refined, sporty look. Another new feature in this segment is a Warmth and Comfort package, which includes heated door armrests and center console, heated steering wheel and rapidly-heating front seats. 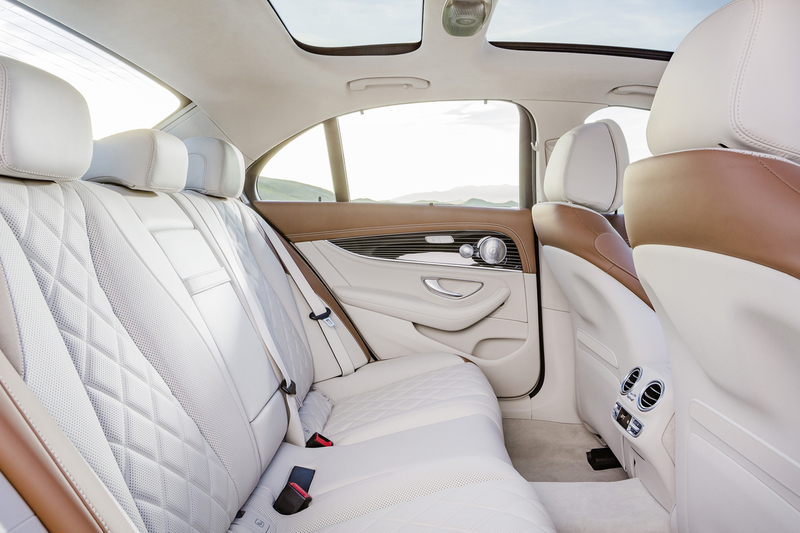 The rear bench seat in the new E-Class sedan comes with a three-piece backrest with a 40% – 20% – 40% split, making it exceptionally versatile. Integral features of the center armrest include a storage box and two pop-out drinks holders. There is also the option of a holder for a tablet device for the rear passengers. 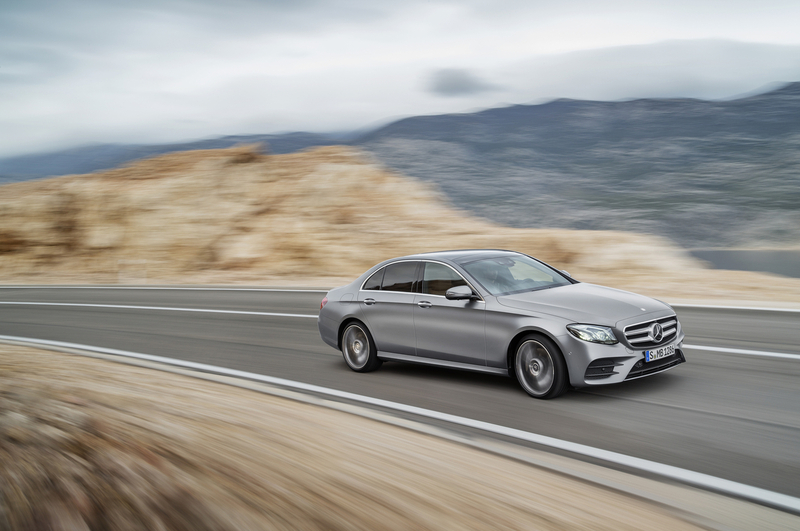 In the US market at launch, the new E-Class will feature a turbocharged 2.0-liter four-cylinder gasoline engine with 241 hp and 273 lb-ft of torque. Further model variants will be added to the range after the market launch. 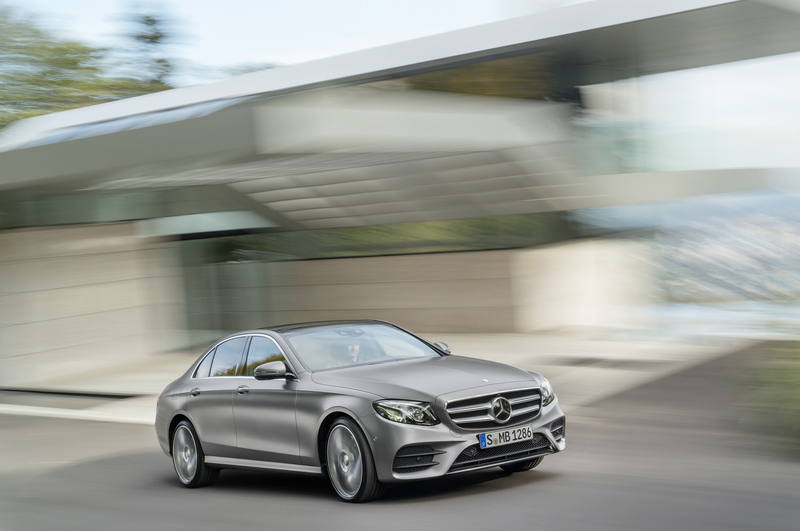 All E-Class models available at market launch will be equipped with the new 9G-TRONIC nine-speed automatic transmission as standard equipment. This advanced transmission enables both fast gearshifts and low engine revs while cruising, which provides improvements in both efficiency and interior noise levels. 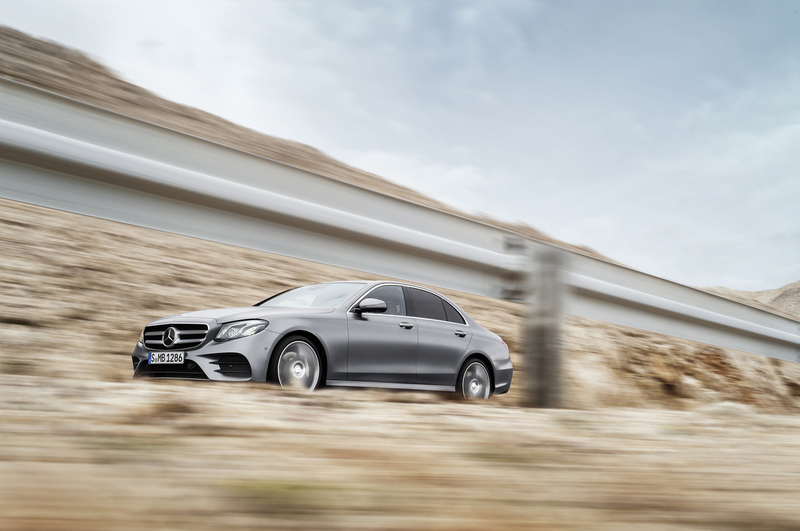 Alternatively, the new E-Class can be equipped with a multi-chamber air suspension at all corners – the only car in its segment to offer this option. Three chambers of different sizes in the spring struts of the rear axle and two in the spring struts of the front axle make it possible to control, in three stages, how firmly the suspension reacts to the road. In this way, the occupants enjoy a soft base suspension, together with the secure feeling of good handling stability as speed increases. Furthermore, the highly sensitive and fast-responding AIR BODY CONTROL air suspension features all-round self-leveling for excellent ride comfort even with the vehicle loaded. It automatically controls the ride height depending on the speed and reduces fuel consumption on the freeway, for example, by lowering the vehicle. 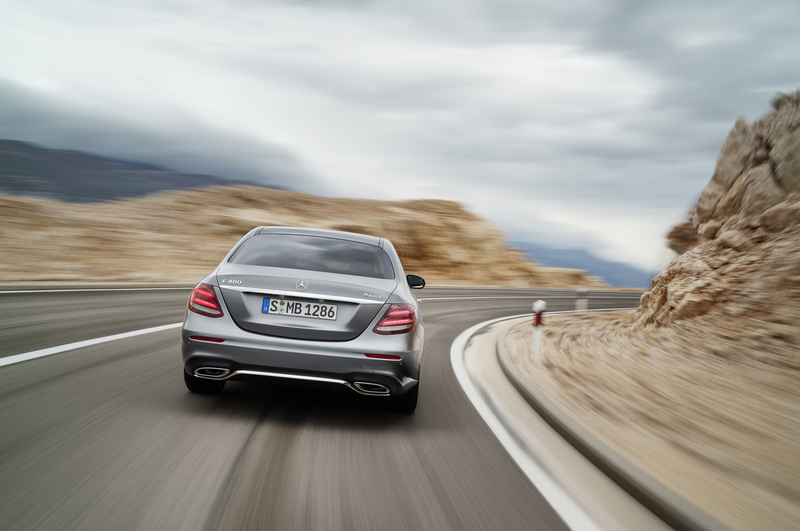 When driving on rough roads, ground clearance can be increased at the push of a button. The multi-chamber air suspension is supplemented by a continuously operating, electronically controlled damping adjustment system, which automatically adapts the damping on each individual wheel to the current driving situation and road conditions. The system therefore delivers good road roar and tire vibration characteristics, excellent ride comfort and outstanding driving dynamics. A DYNAMIC SELECT switch in the cockpit enables the driver to select from four AIR BODY CONTROL modes: “Comfort,” “ECO,” “Sport” and “Sport+.” The additional “Individual” option allows drivers to configure their vehicle to suit their own preferences. 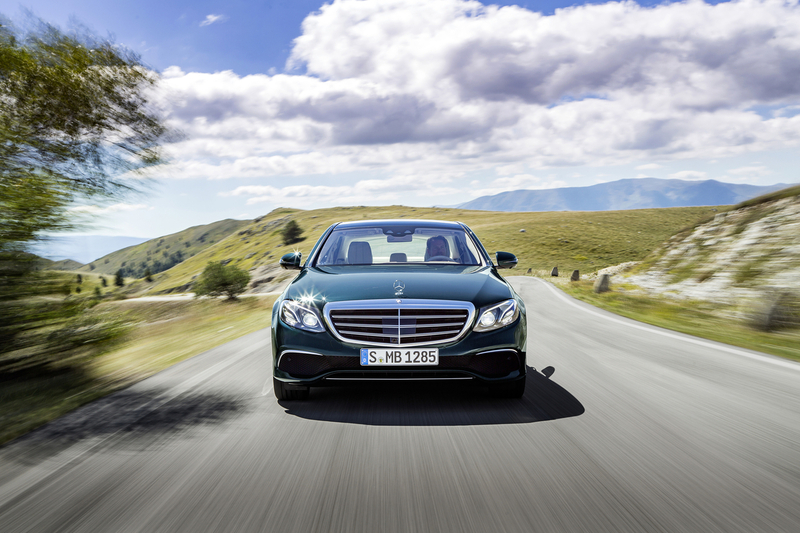 Mercedes-Benz’s new assistance and safety systems take safety, comfort and driver assistance to a new level. 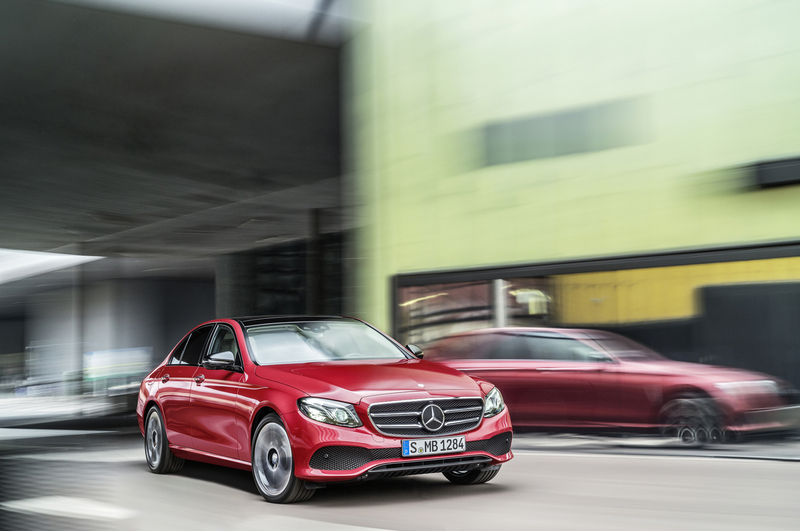 Standard on the new E-Class is PRE-SAFE® Sound. This system is based on a protective human reflex in the inner ear, called the stapedius reflex. PRE-SAFE® Sound emits a short interference signal through the vehicle’s sound system if the risk of a collision is detected. This signal can trigger the natural reflex and thus prepare the occupants’ ears for the expected sound of the accident. Active Brake Assist, fitted as standard, is able to warn the driver of impending crash situations, provide just the right level of support during emergency braking and, if necessary, also apply the brakes automatically. In addition to slower-moving, stopping or stationary vehicles, it can also detect pedestrians crossing within the area ahead of the vehicle. Additional standard equipment includes ATTENTION ASSIST with adjustable sensitivity, which can warn the driver of inattentiveness and drowsiness, and Crosswind Assist, which can assist the driver by substantially mitigating the effects of strong crosswinds to prevent the vehicle from drifting too far off track. DRIVE PILOT: This system represents Mercedes-Benz’s next step along the road to autonomous driving. 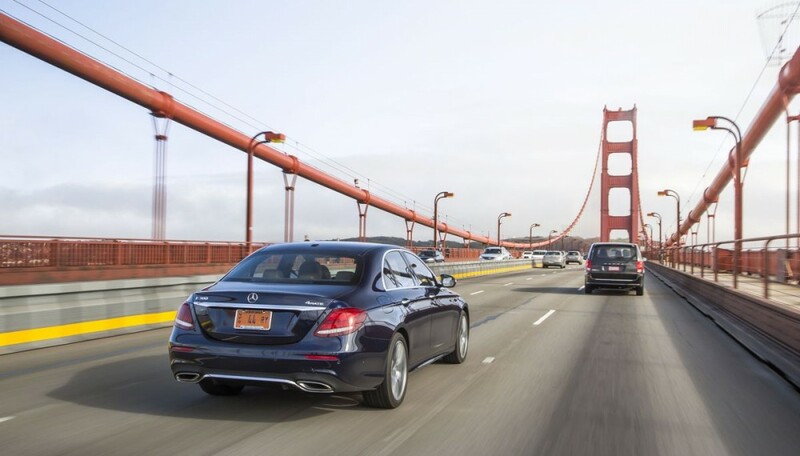 While on both freeways and country roads, Distance Pilot DISTRONIC is not only able to automatically maintain the selected distance from the vehicle in front, but, for the first time, it can also follow the traffic in front at speeds of up to 130 mph. This can make life easier for the driver, who no longer needs to operate the brake or accelerator pedal during normal driving and also receives plenty of steering assistance from Steering Pilot – even on moderate bends. Another unique feature of Steering Pilot is that the system can continue to actively intervene by taking account of surrounding vehicles and parallel structures, even if the lines are unclear or nonexistent, as they can be during road construction, even at speeds up to 81 mph. The system therefore makes driving much easier, especially in traffic jams or heavy congestion. 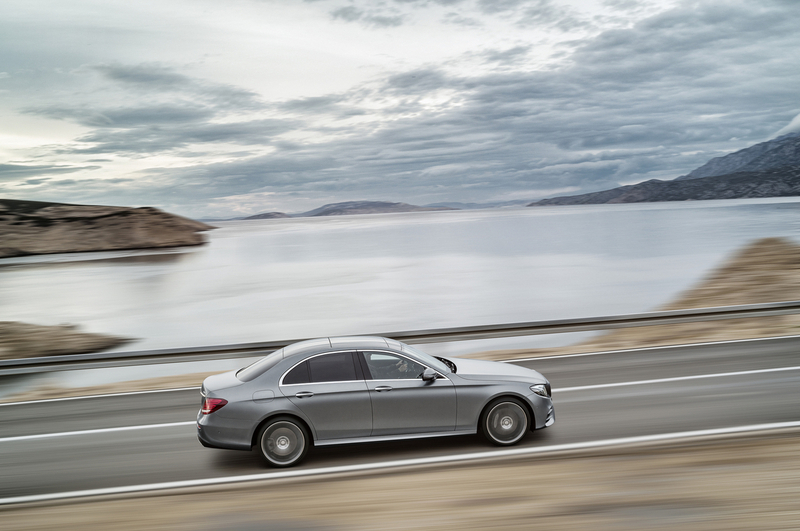 Additional DRIVE PILOT innovations include, for the first time, Active Lane-change Assist. This radar-and-camera-based system assists the driver when changing lanes on multi-lane roads and can steer the vehicle into the lane selected by the driver – when overtaking, for example. Once the driver has indicated a turn for at least two seconds, Active Lane-change Assist assists with steering into the adjacent lane if it detects that the lane is unoccupied. More details will be offered at the time of the U.S. launch in summer 2016. Active Brake Assist with cross-traffic function: Compared with the standard version, this system has extended speed thresholds with respect to vehicles and pedestrians. Furthermore, it can detect crossing traffic at junctions and, if the driver fails to respond, apply the brakes autonomously. For the first time, it can also detect hazardous situations at the tail end of a traffic jam where there is no room to maneuver and initiate autonomous braking well in advance. Consequently, it is possible to completely avoid accidents at speeds up to 43 mph or substantially reduce the severity of accidents at speeds above this level. Evasive Steering Assist: This new system ideally complements the pedestrian detection function of Active Brake Assist. When the driver deliberately or instinctively performs an evasive maneuver in a dangerous situation, this function can assist by adding precisely calculated steering torque to support the movement of the steering wheel. This helps the driver to avoid, for instance, a pedestrian in a controlled manner while subsequently facilitating the straightening-up of the vehicle to allow the situation to be negotiated safely. Advanced assistance systems: The intelligent assistance systems in the new Driver Assistance Package Plus also include proven systems that have been further developed in terms of their mode of operation and the sensors they use. Active Lane Keeping Assist can help stop the driver from unintentionally changing lanes, this being done by corrective one-sided application of the brakes, including in the case of broken lines and risk of collision, e.g. with oncoming traffic or fast overtaking vehicles. Active Blind Spot Assist can now also warn of the risk of a lateral collision in typical urban traffic at low speeds. PRE-SAFE® PLUS can also protect against collisions with traffic following behind, reducing whiplash and other adverse effects on the occupants. Remote Parking Pilot: For the first time, this system allows the vehicle to be moved into and out of garages and parking spaces remotely using a smartphone app, enabling the occupants to get into and out of the car easily, even if space is very tight. More details will be offered at the time of the U.S. launch in summer 2016. 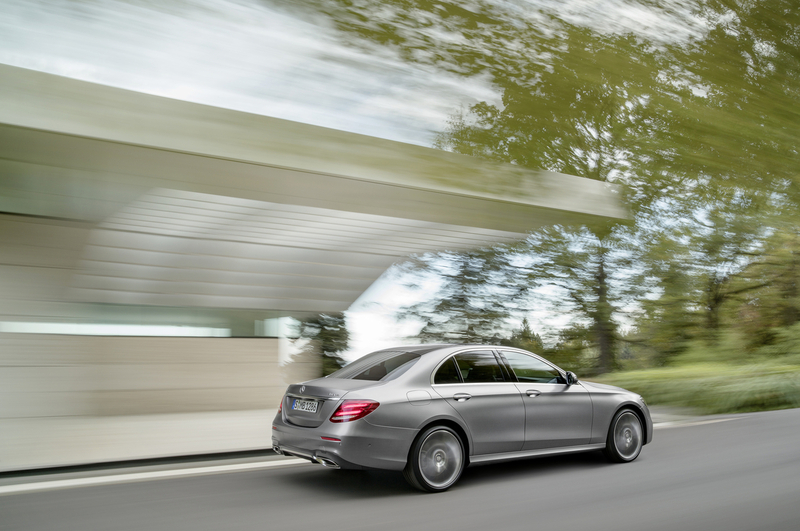 Car-to-X communication: The MY2017 E-Class will have the world’s first fully integral Car-to-X solution going into series production. The mobile phone-supported exchange of information with other vehicles further ahead on the road, for example, can effectively allow the driver to “see around corners” or “through obstacles” well in advance. This means that the driver receives an earlier warning than previously in the event of imminent danger, such as a broken-down vehicle at the edge of the road or also in the event of heavy rain or black ice on the road ahead. 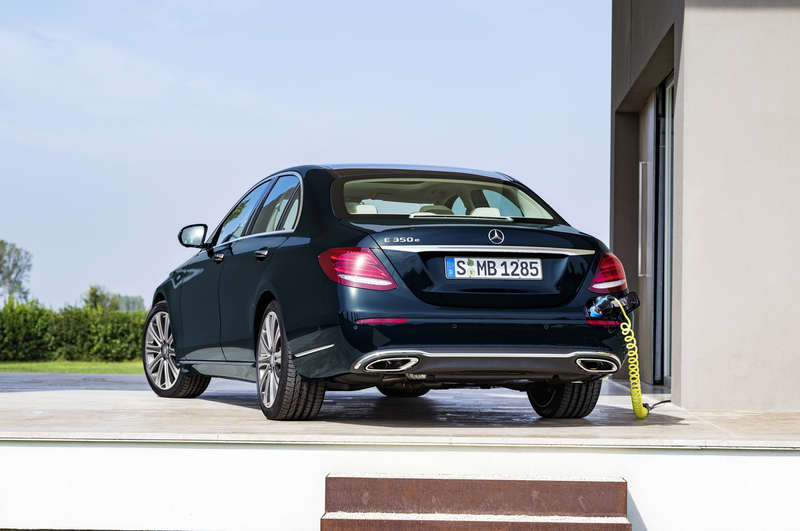 In this case, the new E-Class simultaneously acts as a receiver and a transmitter, since warning messages are conveyed automatically by evaluating vehicle status or manually by the driver to the backend. More details will be offered at the time of the U.S. launch in summer 2016. 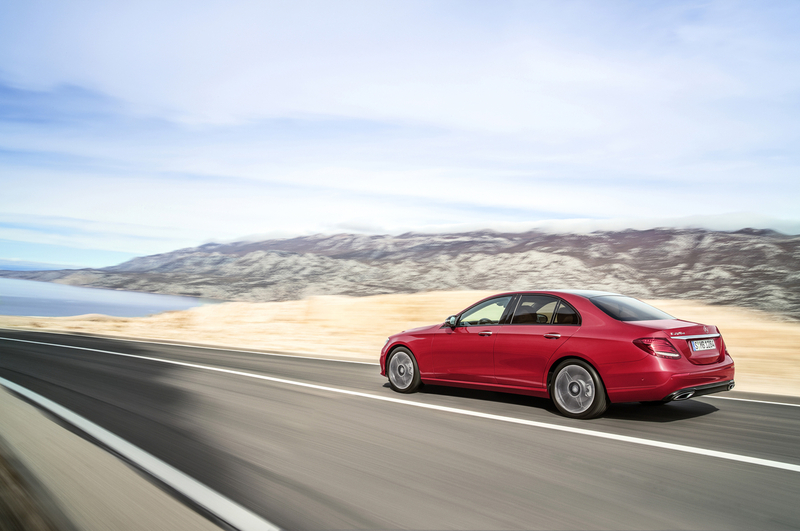 PRE-SAFE® impulse side: This system is part of the Driving Assistance package PLUS. If a lateral collision has been detected and is imminent, it preventively moves the driver or front passenger away from the danger zone to the side. To do this, the system inflates an air chamber in the side bolster of the front seat backrest nearest the side of the imminent impact in a fraction of a second, thus increasing the distance between occupant and door while, at the same time, reducing the forces acting on the occupants. 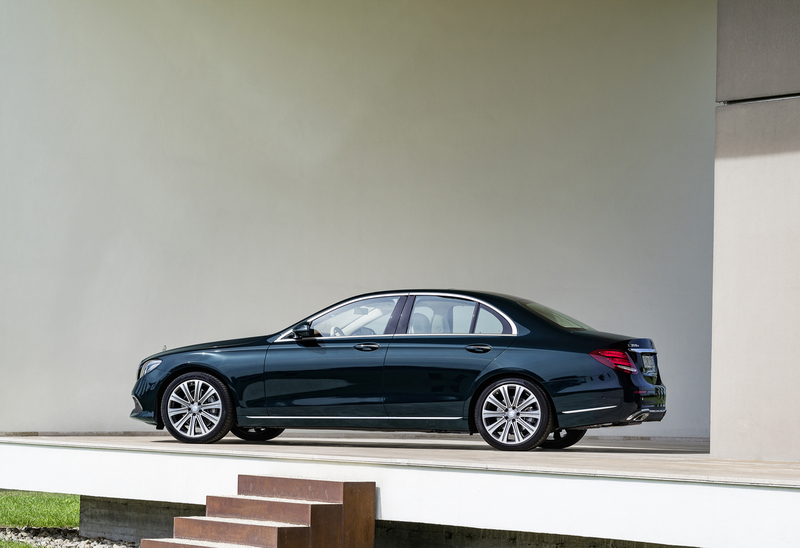 Fitted as standard, the Mercedes-Benz Frontbass system in the new E-Class delivers a unique listening experience, utilizing space in the cross-member and side member of the body structure as a resonance chamber for the bass speakers. 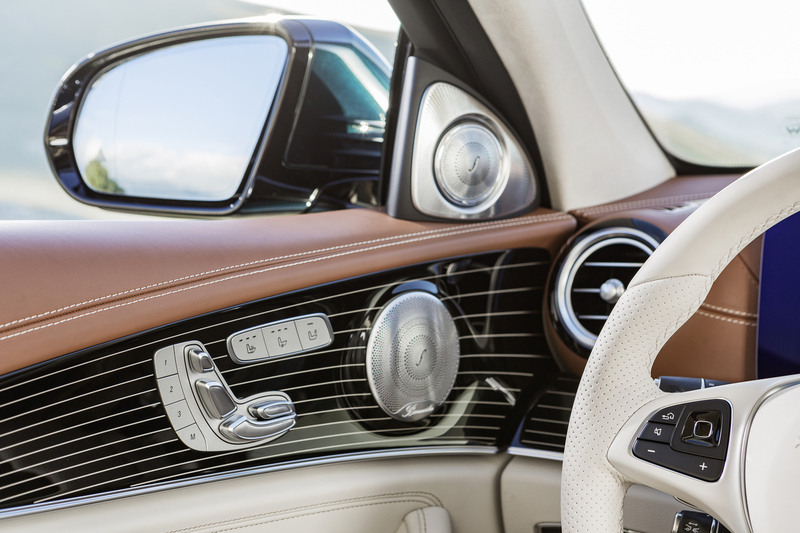 The E-Class is optionally available with two Burmester® sound systems, including the top-of-the-line Burmester high-end 3D surround sound system. If the vehicle is equipped with the optionally available Burmester high-end 3D surround sound system with 23 speakers, the occupants are treated to a listening experience reminiscent of the acoustics in a concert hall, as it includes a third dimension of sound courtesy of roof speakers. An outstandingly stiff body forms the basis for exceptional handling, astonishingly low noise and vibration levels and a high level of crash safety. To achieve this, the engineers opted for a bodyshell with a far higher proportion of aluminum and ultra-high-strength steel components than its predecessor. The front fenders, hood, trunk lid and large sections of the front and rear ends are made of sheet or cast aluminum. This lightweight design reduces fuel consumption while making for perceptibly sporty and agile vehicle handling. 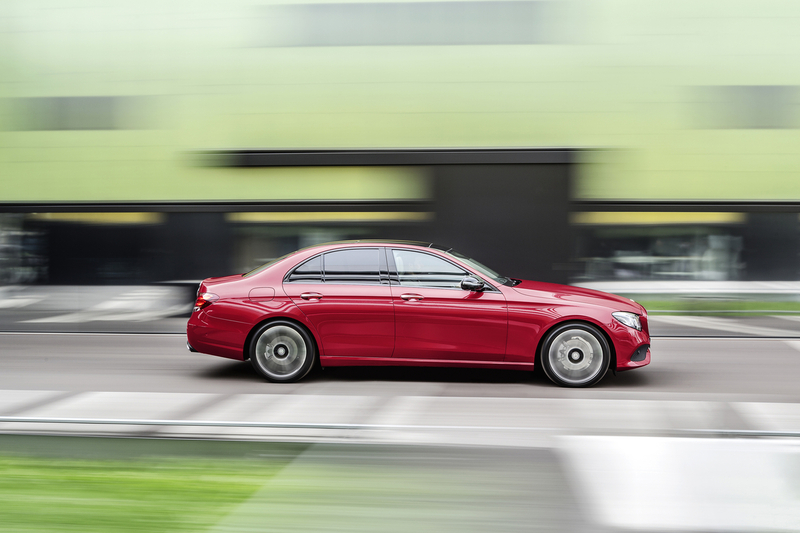 Aerodynamic performance is one of the main reasons behind the outstanding efficiency of the new E-Class. To achieve this, the aerodynamics experts had to optimize numerous details and implement new ideas. 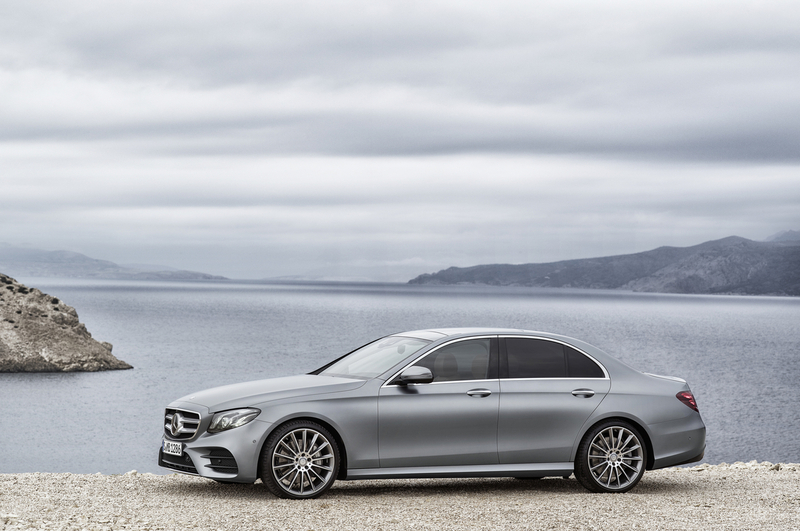 The sophisticated aerodynamics also minimizes wind noise while making sure that the new E-Class is quieter than many luxury-class models. 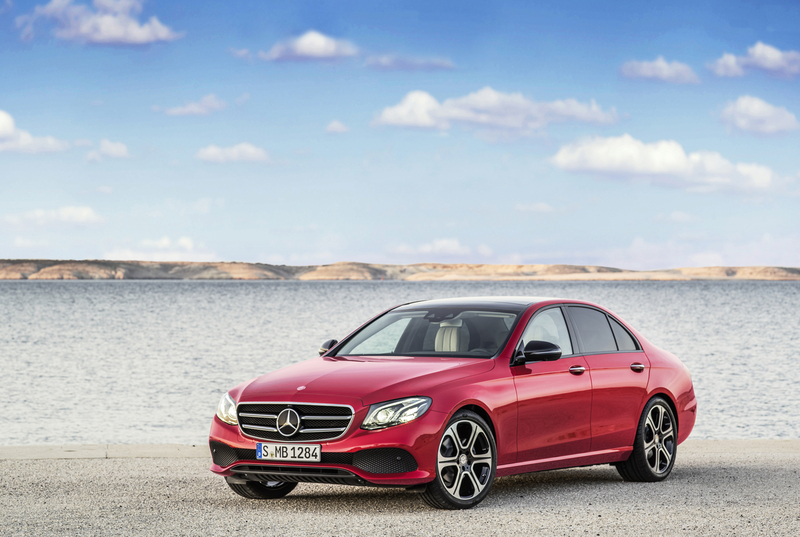 The 2017 Mercedes-Benz E-Class will be available at US dealers in the summer of 2016. 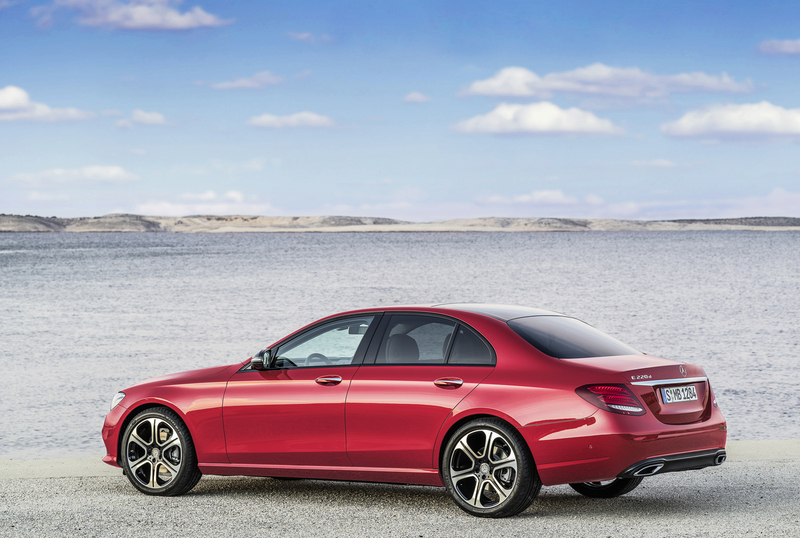 2017 marks the 10th generation of the Mercedes-Benz E-Class luxury sedan. European model shown.